A Senior member of our team in Sydney came over to Manila last month for a series of trainings to our new team members. As a gesture of Filipino hospitality, we toured her around Intramuros. We visited Manila Metropolitan Cathedral, Fort Santiago and Intramuros and Rizal Bagumbayan Light and Sound Museum. The day ended with a sumptuous dinner of Filipino sea food cuisines at a restaurant in Seaside Macapagal Avenue. Also known as the Cathedral-Basilica of the Immaculate Conception, it serves both as the Prime Basilica of the Philippines and highest seat of Archbishop in the country. A 16th century military defense fortress built for Spanish conquistador, Miguel López de Legazpi. It is also where Rizal shrine is located, it exhibits some memorabilia related to the life and work of our national hero, Jose Rizal. The lights and sound museum brings visitors on a journey through Philippine history under Spanish rule through engaging dioramas, images, sounds, lights and robotics. Truly, a cultural re-awakening activity for all of us! Intramuros holds a special place in my heart as I've been there for numerous times. It's a place where I had a field trip when I was in high school, it was a site for a quick historical tour when I was in college, also a venue for a video and photo shoot for an event in our office a couple of years ago and simply a place to hang out. And now, to show an Australian colleague the Philippines' vibrant past. Thanks to Herbert, Rommel and Glen for the photos I used in this post. 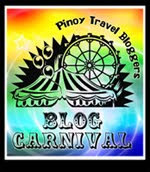 This is my entry to the Pinoy Travel Bloggers’ Blog Carnival for August 2011 with the theme "In Focus: Manila, Our Manila" hosted by Angel Jaurez of Lakwatsero. How about you? Have you been to Intramuros lately? Posted on August 23, 2011 Categories: Blog Carnival , Churches , Metro Manila , Trip ko 'to..
nice.. buti na-feature mo yung Lights and Sounds Museum.. hndi kasi sya masyadong napapansin sa Intramuros.. Yes, i have been to Intramuros lately and many times in the past. But I have not gone inside the Lights and Sounds Museum. Makapunta na nga! definitely the place to show visitors if they are looking for philippine history. intramurous was the first place i showed my american friend. he was impressed. The Light and Sound Museum looks interesting, I should try that next time. nice reviews! new follower here! How much po ung sa lights and sound museum pagpumasok dun? hmmm... ang naalala ko around 150 lang yata yun.. basta mura lang cya... the most na cguro ang 300... hehehe... sorry di ko talaga maalala... hehehe!